The sheer quantity of chicken pot pie recipes in the archives should give you a slight indication on how much I adore it. Okay, so there’s only two others, but that’s a lot for someone who doesn’t often repeat. Really, what’s not to love?? Tender pieces of chicken, crisp veggies and a luscious sauce, all wrapped in a warm and cozy crust. Yep, I’d say that’s pretty much as close to comfort food heaven as you can get. My infatuation of chicken pot pie started long ago, when my Grandmother first inverted a Swanson’s individual chicken pot pie on the plate in front of me. She then proceeded to cut it up until it resembled, for lack of a better word, mush. It sounds sort of unappetizing, but I’d equate it to the same general idea as the Thanksgiving mashup – when turkey, gravy, mashed potatoes and dressing are all forced together in one complete bite. Each time she served it, I watched as the steam poured out from the broken crust, squirmed in my seat, and impatiently waited for it to cool down enough for me to dig in. 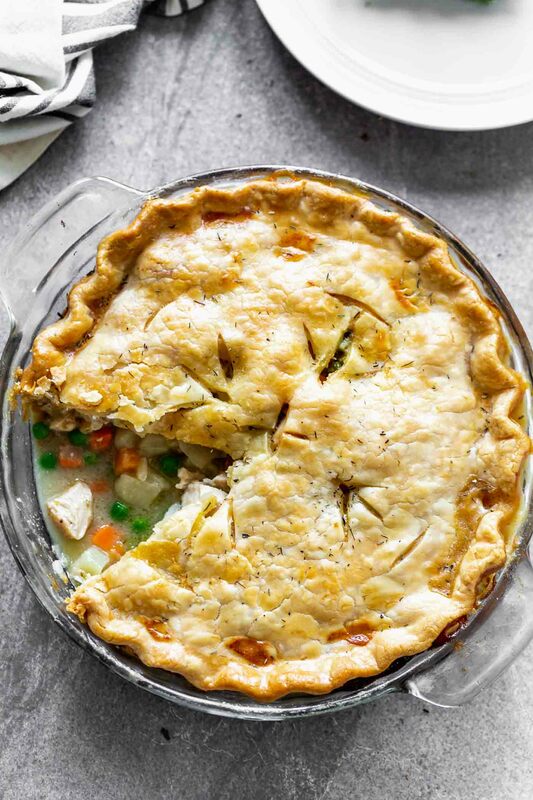 As an adult, I get the same restless itch to dig in to chicken pot pie before it’s cooled off enough to keep from singeing every taste bud on the tip of my tongue. It’s one of those nostalgic feelings, and I’m sure it’s the reason I adore a pot pie to this day. Not to say that those frozen chicken pot pies were anything to write home about. The chicken was lightly rubbery after baking, and the vegetables, no longer vibrant and crisp, but for some reason, I still inhaled them as if they were. There were however, two things that were actually good about them. The soft, almost dough-like bottom crust and the plethora of salty sauce enveloped around the chicken and vegetables. 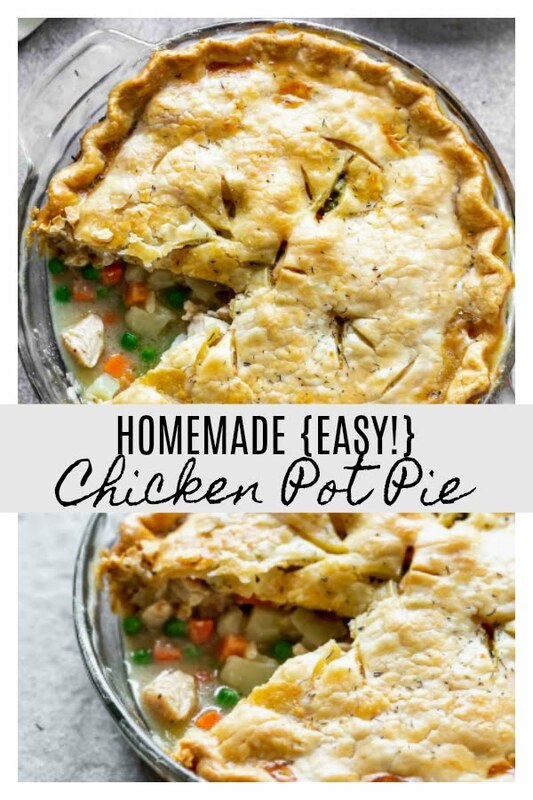 Another chicken pot pie recipe? 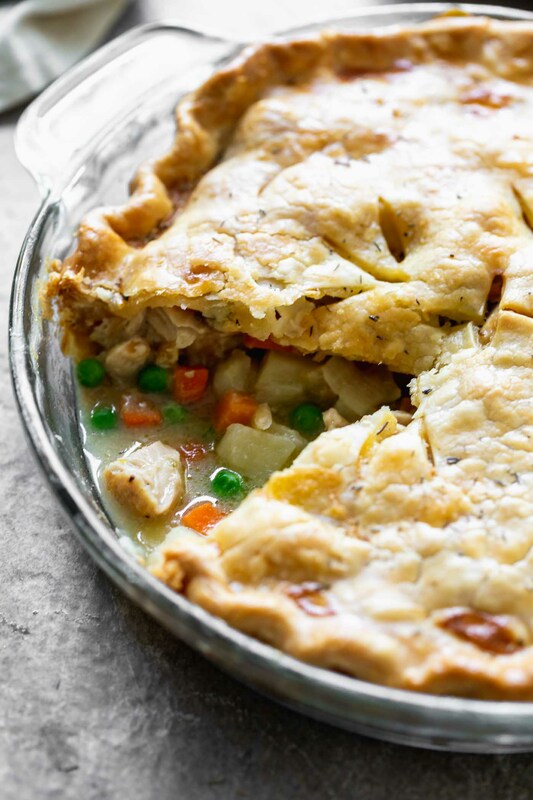 On the blog I’ve shared a lightened up chicken pot pie, and cobbler-like chicken pot pie, but I’ve neglected to share a classic version. So today is your lucky day. 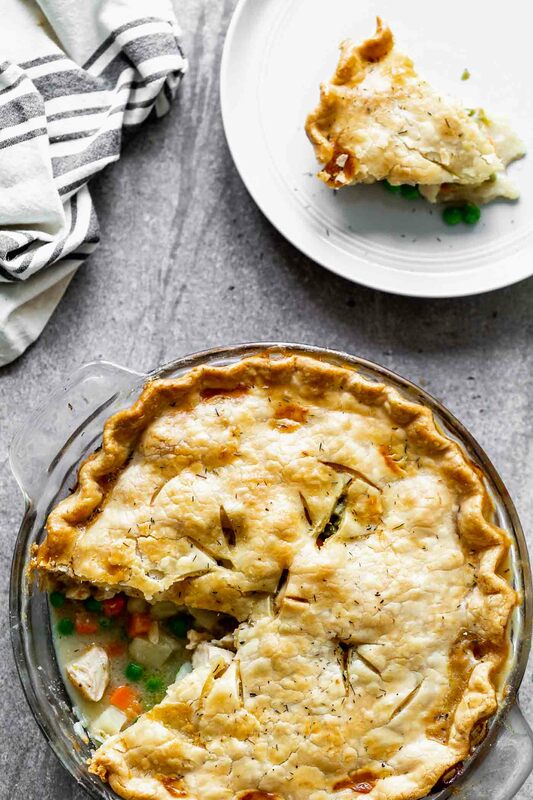 Friends meet a classic: Easy Chicken Pot Pie. 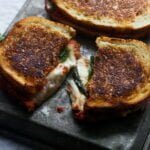 I wanted this to be something that’s approachable for everyone, so what you won’t find are any fancy ingredients, infinite steps, or a homemade crust. 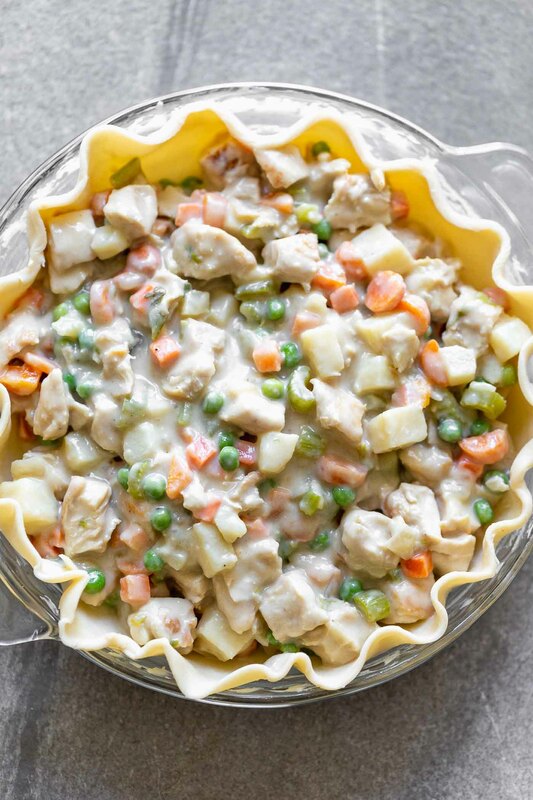 What you will find, is a straightforward, minimal-ingredient chicken pot pie that can be thrown into the oven in under 30 minutes and every bit as delicious as it sounds. And while it does take almost an hour in the oven, it’s all hands-off time. Plus, it will perfume your house with the most intoxicating fall smells. Because any simple meal goes from good to great with plenty of seasoning and layering flavors on top of each other, I like to start by cooking the chicken in the same pan I cook the vegetables and make the sauce in. When the chicken cooks, it leaves behind a million little flecks of flavor in those brown bits you find at the bottom of the pan (it’s technically called frond) you want in the finished product. Also, whenever I’m using chicken in a casserole or soup that is essentially double-cooked, I like to use chicken tenderloins to ensure the chicken stays nice and tender from start to finish. If chicken breast it all you have, or it’s what’s on sale, no problem! When the chicken is cooked, it’s removed from the pan and the veggies go in. I like to essentially get them started, but I also make sure they don’t cook too much, because you want them to stay nice and crisp throughout the baking process. 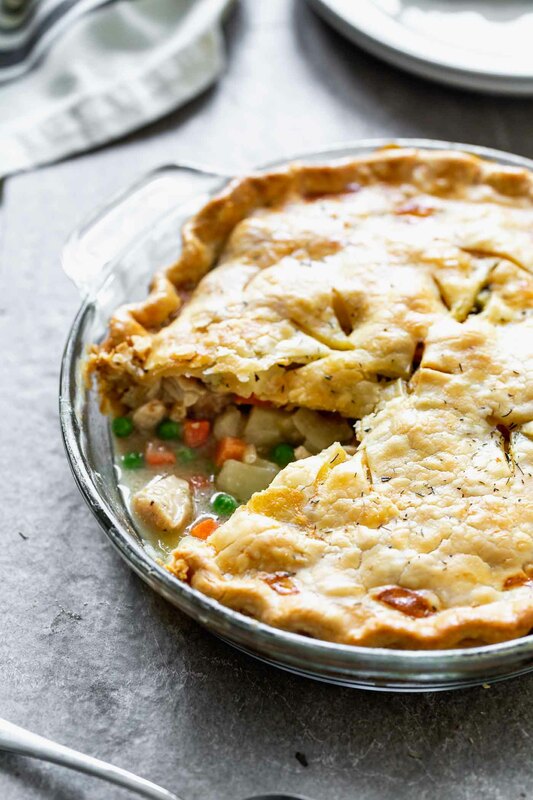 I know I said there’s an absence of “fancy” ingredients, but there is one ingredient you may find to be on the “fancier” side, but one I find to be a key player in setting this chicken pot pie apart from it’s other classic competitors. Dry sherry. 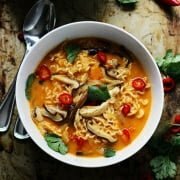 It’s one of my very favorite secret weapons in any sort of creamy casserole or soup. It adds this almost nutty, sweet underlying tone I absolutely adore, and for me, is essential here. I like to buy mine at a liquor store to ensure it’s quality, but you can also find non-alochlic versions at any grocery store. Once the filling comes together, it’s time to assemble. In sticking with a minimalistic-is-better theme, I went with a store-bought pie crust, and I’m so glad I did. 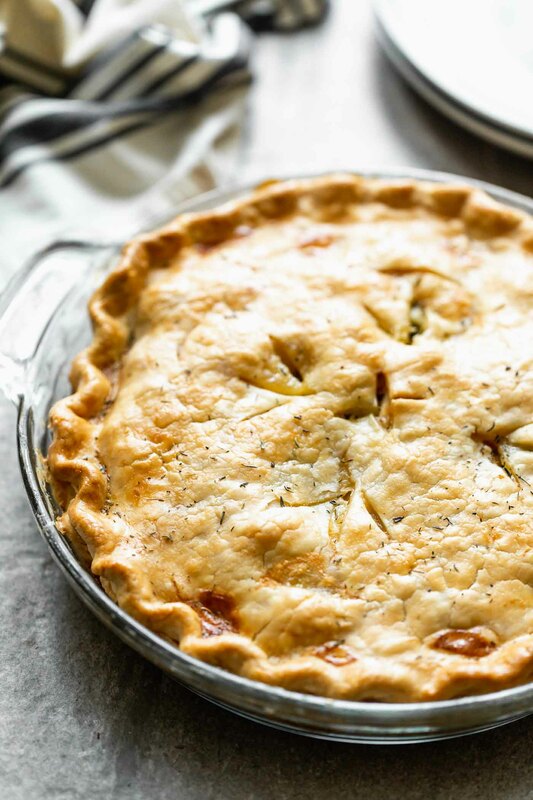 It’s as simple as laying the dough in a buttered pie dish, pouring the filling on top, covering it with the second piece of dough and sealing the edges together. If you know how to make a pretty crust, go for it, otherwise, just brush some egg wash on the edges of the bottom crust and use the tines of your fork to seal it together. If you want to know how to make it pretty, see this tutorial. After the top gets brushed with egg wash, a few slits are cut in the top to release the steam, and it goes into the oven until the crust is golden brown and the filling is bubbling out of the top. If you’re a patient person, wait a few minuets for it to cool down before cutting into it. 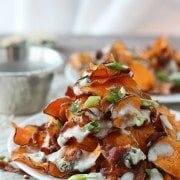 If you’re like me, dig in right away, and know that the burnt taste buds are worth the immediate gratification you get from getting the first bite. Make sure to cut all your vegetables similar in size so they cook evenly. Don’t be shy with the egg wash! You want your crust to be golden brown and glistening. Sprinkle a little bit of dry thyme on top of the crust to make it look homemade. Take a shortcut by using a package of frozen carrots and peas. Adding warm/hot chicken stock and milk to the flour will help it thicken quick. And prevent lumps! YES! I actually made the filling the day before, cooled it and stored it in an airtight container. I poured the chilled mixture directly into the prepared baking dish and popped it in the oven. You could also probably assemble the entire pie the morning of, or night before. Just don’t forget to brush with egg wash before baking! 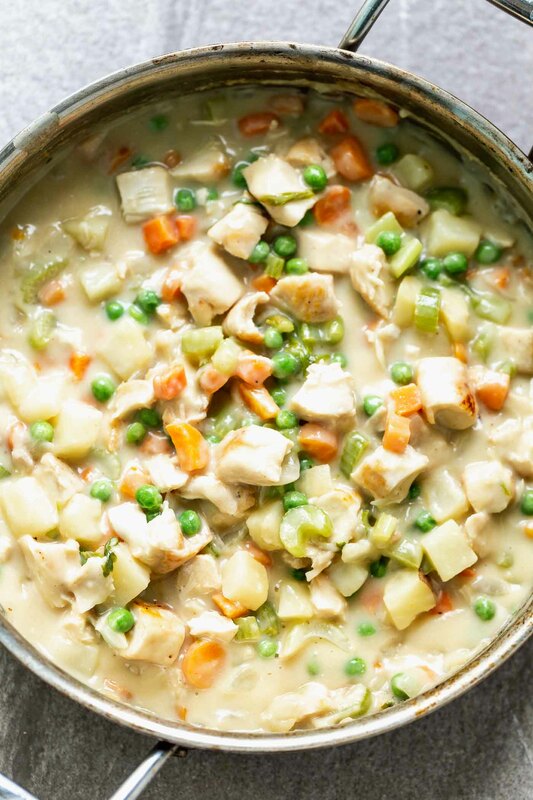 Is easy chicken pot pie good leftover? Absolutely. While the crust won’t be flaky and crispy anymore, the flavor is still there. 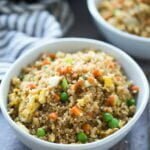 We’ve been eating off this for the better part of a week and it’s still DELICIOUS. And the softer it gets, the more my infant loves it. 9.5″ Pie Plate :Simple and effective! Lagostina Copper Pan : One of my very FAVORITE vessels to cook with! 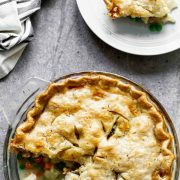 This Easy Chicken Pot Pie takes a shortcut from store-bought pie crust, and a super quick filling that's SO delicious! Preheat oven to 375 degrees. Grease a 9.5-inch glass pie pan. 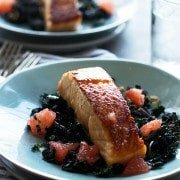 Season chicken breasts liberally with salt on both sides, and with just a little bit of black pepper,. Heat a large skillet to a medium heat. Once the skillet is hot. Add two teaspoons of olive oil. Cook the chicken until golden brown on both sides and cooked through, about 2-3. minutes on one side, 1-2 minutes on the other. Remove from pan and set aside. Add remaining olive oil and butter to the same pan. Add celery, potato, carrot, onion and salt. Stir with wooden spoon. Sauté veggies until they are slightly softened, but not cooked through, about 2-3 minutes. Add flour. Stir to combine. Cook for 1 minute. 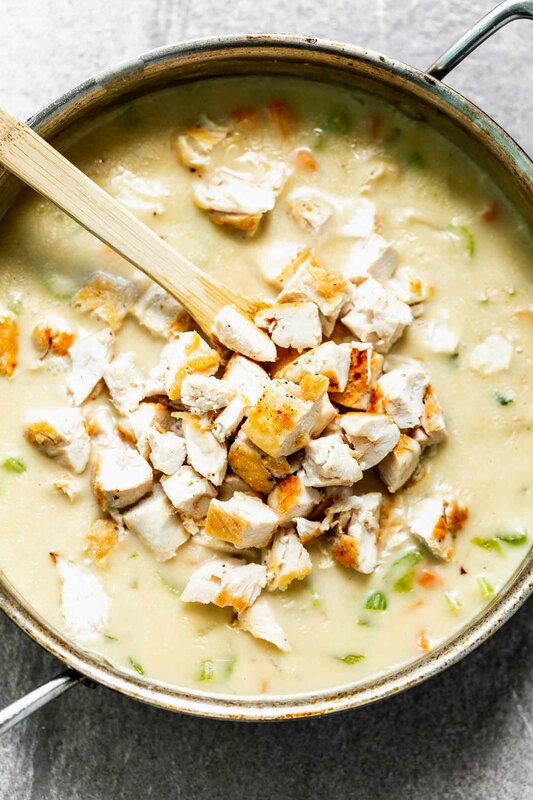 Turn the heat off and slowly whisk in chicken stock and whole milk, making sure there are no lumps. Whisk in sherry. Use a wooden spoon to scrape all the brown bits off the bottom of the pan. Bring the mixture to a boil, then reduce to a simmer. Simmer until very thick, 2-3 minutes. While the sauce and veggies are simmering, chop the chicken into bite-sized pieces. When the sauce is thick, add chicken and season to taste with PLENTY of salt and pepper. Add frozen peas in, stir. Set aside. 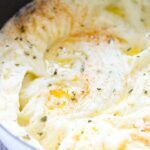 Whisk water and egg together in a small bowl. Place one crust in the bottom of the prepared pan. Pour the pot pie mixture on top. Brush the bottom crust with egg wash and cover with another crust. Fold the top crust under, sealing the top and bottom crust. Crimp edges of crust. Brush the entire top with more egg wash (be generous!). If desired, sprinkle with dried thyme. 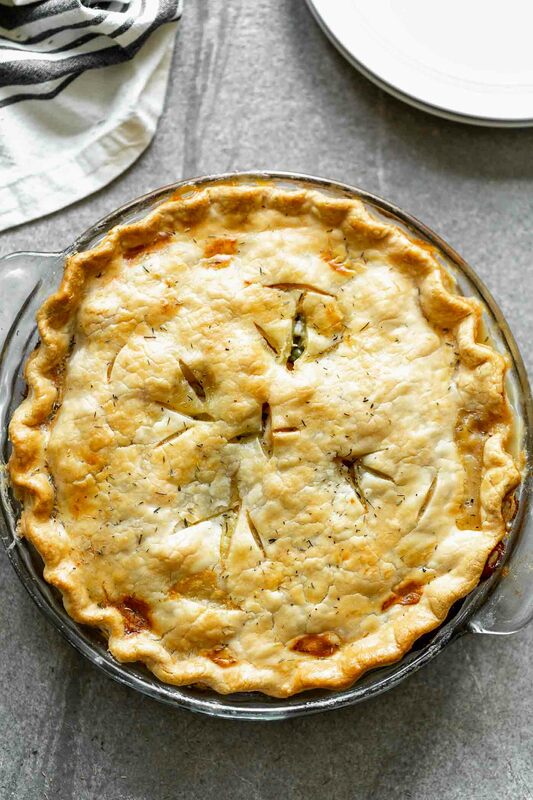 Use a sharp knife to cut vents in the top of the crust to allow steam to escape while baking,. Bake in the oven until top crust is golden brown and filling is bubbling, about 45 minutes. Cool for five minute before serving.